In our previous article we have seen how to add tables in WordPress site and TablePress is one of the plugins allow users to add table on WordPress site easily. 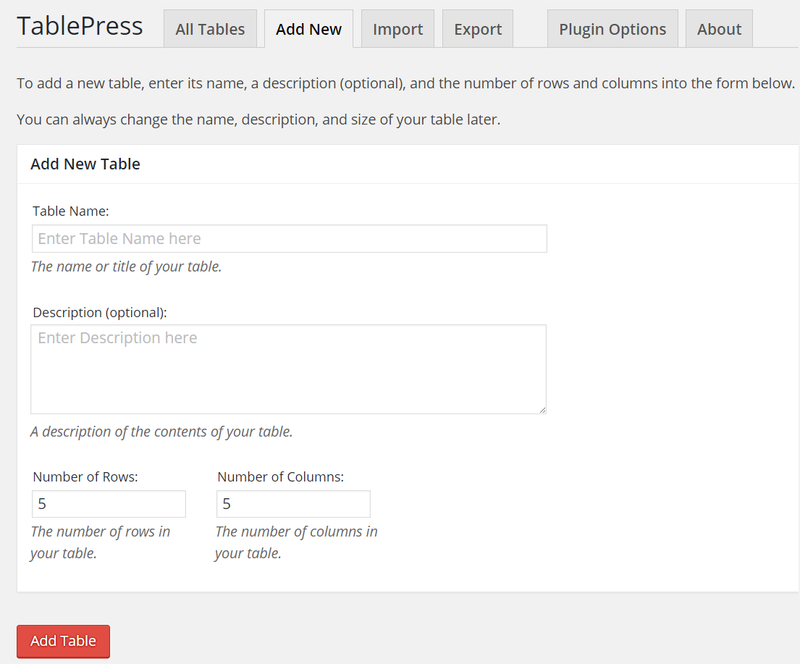 In this article let us explore the features and how to use TablePress plugin. Navigate to “Plugins > Add New” option in WordPress admin dashboard and search for the keyword “Table”. You will find thousands of plugins for creating different type of tables and searching for “tablepress” will show the TablePress plugin on first page. It is a complete free plugin by author Tobias Bäthge. Though extensions are offered as separate premium plugins there are no intrusive banners or links asking you to upgrade from the dashboard. 400K+ active installs with 5 star rating from 2K+ users can’t be a wrong judgement. Decent documentation and very good supporting on the forum. Create uniform looking tables through the site and also customize any particular table’s look using custom CSS. Import tables from Microsoft Excel in XLS, XLSX and CSV formats. Also importing by manual copy paste and from JSON/HTML format is also possible. Tables can be exported in CSV, JSON and HTML formats. Complex data tables with search box, pagination and filtering can be created easily. How to Use TablePress Plugin? The position of the TablePress menu can be modified under “Plugin Options” section. Plugin Option – individual tables can be customized with CSS under this section. Navigate to “Add New” tab where you can enter basic details like table name, short description and choose number of columns and rows to create a table. The next screen will show you plenty of options in multiple sections. You can easily be familiar with these options by creating one or two sample tables. Here you can view the basic details you had entered on the creation screen along with the shortcode for your table. Here is where you need to enter the actual content of your table in rows and columns; the first row is by default considered as a table heading which you can change it under the “Table Options” section. Add rows and columns to your table. Hide, show, delete, duplicate and insert rows and columns. Click on the “Insert Link” button and choose the table cell to open the default WordPress insert link popup. You can also directly add links using HTML anchor tags. Similar to links, click on the “Insert Image” and click on the cell to insert images from WordPress media library. You can also directly add images using HTML img tag. The advanced editor allows you to add formatted content using simple editor. Use rowspan and colspan options to combine cell on a row and columns. Here you can define the header, footer, different colors for alternate rows and highlight row on hover. You can also display the table name and description above or below the table. Add extra CSS classes to customize the appearance of the table, you need to use these CSS classes at theme level and define styles. When you have enabled the first row of the table as header under “Table Options” section, then the table can be converted to a data table by enabling the features under this section. Sorting based on the any of the column just by clicking on the column. Searching / Filtering – allows to show a search box on top right corner of the table and users can filter the results by entering a keyword. This is a very useful feature especially when you have many rows and the content is not visible due to pagination. Pagination – enable pagination to show only particular rows with “previous / next” pagination links at bottom right corner of the table. You can also allow the user to filter and view particular number of rows. Enable horizontal scrolling if you have many columns in the table and add custom commands if you know how to use advanced data tables. Once you have completed the options, preview the table and save the changes. You can also delete, copy and export the table from the same screen. Each table in TablePress will have a unique id which can be seen on the “Table Information” section and used as a shortcode on the visual editor like [ table id = 100 /]. Also you can directly insert the table on the editor using TablePress icon. All the tables created with TablePress can be seen under “TablePress > All Tables” menu. You can carry out actions like copy, export and delete on individual tables as well as on bulk. Importing source can be from a file on your local computer, from a URL, from a file on a server or a manual input. Based on the source, either upload the file from your local computer or provide the required details. Choose the file format, if you are using XLSX then choose “XLSX – “ option from the dropdown. Though XLSX is still a beta option, it works perfectly as we tested. Choose whether to create a new table or modify or append an existing table. Choosing replace and append options will show a dropdown list of all existing tables from which you can select a table. Click on the “Import” button start importing table. The plugin allows importing multiple tables as a zip file. For example, if you have five XLSX spreadsheet tables, put all files in a single folder and compress it in a zip format. Just upload the zip file to create five tables. Similar to importing, all existing tables can be exported to CSV, JSON or HTML format to your local computer. Also the plugin allows selecting multiple tables and exporting as a zip file. The CSV and HTML formats only export the table content and JSON format includes the table options as well. Till now what we have seen are the default options and under “Plugin Options” tab you can enter custom CSS to control either all tables uniformly or control individual tables display. .tablepress – all TablePress tables should have this class. .tablepress-id – used to style a specific table. .column-id – used to style the column of a table. .row-id – used to style the row of a table. Below CSS code need to be added in the text area under “Plugin Options > Custom CSS” and ensure to check the option “Load these “Custom CSS” commands to influence the table styling”. Responsiveness of tables on mobile devices which can be resolved by installing the plugin extension. If you face any other specific issue on your site, refer the forum to see whether it is addressed and checkout the documentation before raising the support query. We noticed most of the issues have been addressed in one of these places. Inserting HTML tags in table cells are not supported, though you can use image tag, link tag, use advanced editor and extension for adding links. Though the basic needs can be satisfied with the free version of the plugin, you can download additional extensions from TablePress Extensions Page for enhancing features of the tables. Again as a contribution to community the author offers all extensions for free and names few as premium with a request of donation. Out of all extensions, we found “Responsive Tables” is the one you may need to make the table viewable on mobile devices. Each extension can be downloaded and installed by uploading the zip file through your WordPress admin dashboard under “Plugins > Add New > Upload Plugin”. You can also use FTP to upload the extracted plugin folder under “/wp-content/plugins/”. 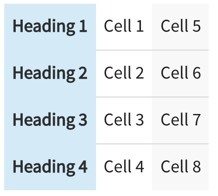 Below is an example table created with flip style using responsive tables extension. Google shows the result with table if your page gets enough traffic for the keywords within the table content. Though the meta description of the page is not displayed, we noticed the table view attracts more users than the simple text. TablePress is definitely a cool plugin to have uniform tables throughout a site while having option to customize individual table as per your need. There are also many extensions available to make the tables more appropriate for specific needs. We highly recommend users to give this plugin a try while donating to the author as an award for the excellent work. There are plugin for editable tables, however we don’t see you can add buttons and use it like a form.